Yeah, firestaffs (AKA flamethrowers) are pretty low-tech for a sci-fi universe, but I just think they’re pretty cool to draw. I was originally planning to make them exclusive to the Kaagan-Vas, since they spread terror by burning things down, but at some point I decided to have them used by Dhama Suul’s men as well. The designs are fairly different though between the two types. I love the second panel. The two flashes of the firing pistols, and the two hits on the Kaagan-Vas, are, to me, much cooler than the Star-Wars-style blaster shots. More realistic, as far as laser gunfights with talking space goats go. Combined with the shadows of the hutch Cember is in, the snow falling and the dark skies, it really looks fantastic. Thanks, Joe! 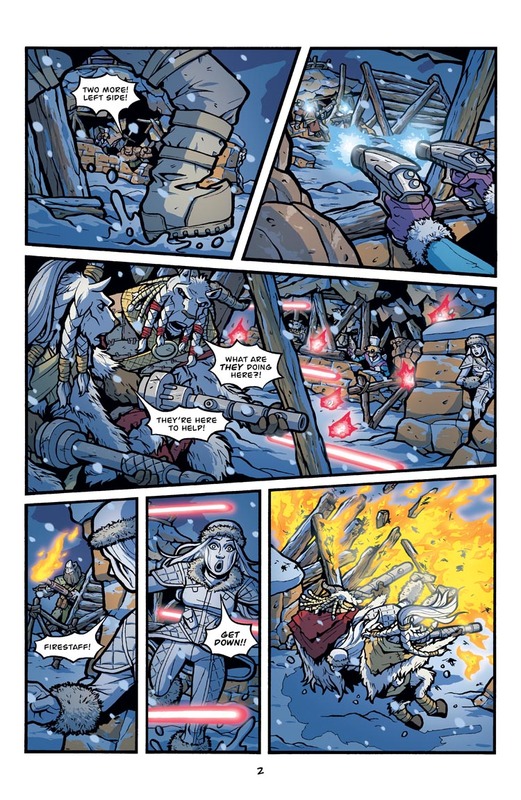 I’m kinda partial to laser bolts since they add that visual bit of flair, but I have to admit I also like how the shots turned out in panel 2. Glad you’re liking the art. I think this entire nighttime sequence turned out pretty good!